Big Brother Gossip: Kevin wins Part I of the final HoH competition. 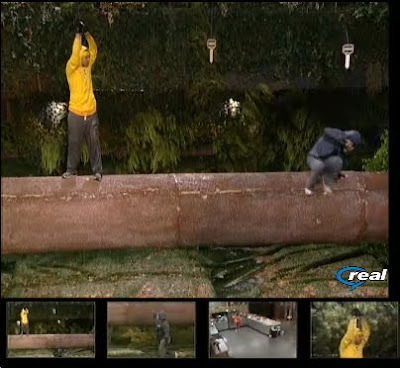 Natalie kept her word to Kevin and dropped off the log to let him win Part I. Part II should be tomorrow - although there is a rumor out there that the third HG may stay in the house longer and the final part might not be until NEXT Tuesday. I sort of doubt that though. Yea, sounds like another get Natalie out the house rumor to me. There have been plenty of them like Natalie and Kevins cheating or she just made Jesse in the pandora box and her boyfriend proposal was a lie... and the damm beat goes on. Since there will be an even number of jury members, perhaps they are making it a final 3, like apparently they do in Survivor? I hope that doesn't happen, and doubt it will, but that's the only scenario I can think of where the third HG would stay longer than they needed to. There would be no point in last nights competition to make it a final three. But it does seem the 'rumor' that the 3rd HG won't be booted out until next Tuesday is gaining momentum. Guess we may have to wait to see what develops over the next day or so.